This guide has everything you need to know about installing a central air conditioner. It will walk you through the process and terminology as you plan to have your central A/C installed. If you want to alleviate the problem of which air conditioning system is right for you, how they work, sizing, installation and what to expect when your technicians get started, you're in the right place. 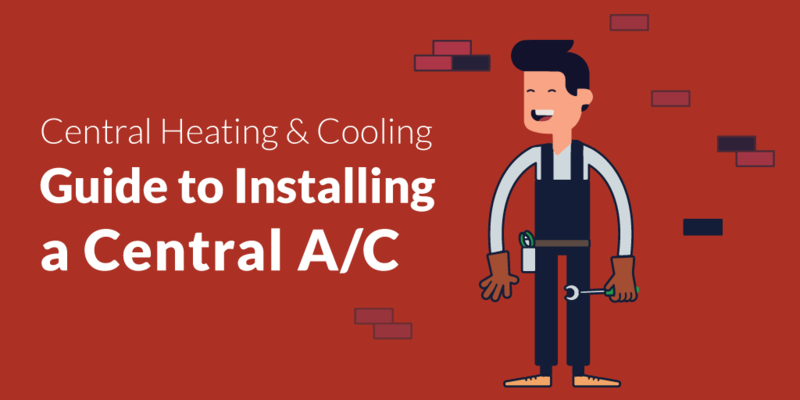 Bonus Offer: Download our Guide to Installing a Central A/C as a PDF for free. Easily save it or print for reference anytime. When adding to an existing central heating & cooling system, central air for a 2,000 square foot home roughly costs $3,500 to $4,000. If ducts need to be added the cost will increase. The final cost will depend on the system, additional items added and the technician's installation rates. And whether or not you've got ductwork, adding central air is more affordable and less disruptive than you might imagine. 1. What actually is a central air conditoner? The central air conditioning system found in most homes are a "split system". This typically means there is a compressor unit (outside) and an indoor coil, installed on your furnace inside the home. 2. How does a central A/C system work? 3. What does the term HVAC stand for? HVAC (Heating, ventilation and air conditioning) is the technology of indoor and vehicular environmental comfort. It's goal is to provide thermal comfort and acceptable indoor air quality. 4. How often should I replace my filters? And why do I need to change my filter regularly? Changing your furnace filter is one of the least expensive maintenance items for your home with one of the greatest benefits. They should be changed regularly to improve air quality, increase the efficiency of your furnace and extend the life of your HVAC system. 5. How often should I have maintenance done on my unit? Keeping your AC system running smoothly depends on proper maintenance and service needs. 6. What size central air conditioner should I have? Too big? It will not be energy efficient. Most will turn on quickly, cool your house, then turn off. Then repeat the same cycle. Too small? Your A/C will constantly run trying to cool your home. This will increase the wear and tear on the unit. Just right? a properly sized central A/C will run through the required amount of cycles to keep your house comfortable, but will not run inefficiently. What Size Central Air Conditioner Do I Need for My House? Go to Chapter 5 for more on sizing. 7. Should I close the registers and doors to areas of the home that I do not use on a regular basis? The short answer - closed vents increase pressure. Here's an excerpt from Energy Vanguard, "When you start closing vents in unused rooms, you make the duct system more restrictive. The pressure increases, and that means an ECM blower will ramp up to keep air flow up whereas a PSC blower will move less air. 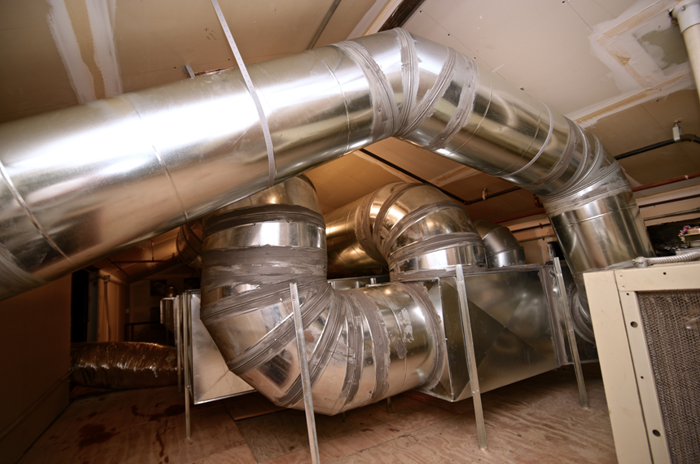 Most homes don't have sealed ducts either, so the higher pressure in the duct system will mean more duct leakage." They summarize 9 unintended consequences of closing vents. 8. What is the SEER rating? SEER stands for Seasonal Energy Efficiency Ratio. It is the ratio of the amount of cooling produced (BTU) divided by the amount of electricity (watts) used. The ratings measure an A/C unit's energy efficiency. The higher the rating, the most efficient. The ever-present federal EnergyGuide label can help you determine a unit's SEER rating at a glance. The label helps identify high-efficiency A/C units. 9. Should a thermostat be set to "auto" or "on"? When Setting Your Thermostat, Should You Use Fan On or Auto? Why "On" Isn't always the best choice. What are the Advantages and Disadvantages of the settings? 10. What's the difference between a split and a package unit? Whether you are a homeowner looking to upgrade your system, a homeowner looking for available options, or a business adding A/C, there are a variety of central air conditioners on the market. The most common or popular is the split systems. Simply put, the split system has it's cooling parts of the unit inside the home, and it's heating parts outside of the home. With a split system, the condenser and compressor are housed outside. An indoor cabinet has the evaporator coil. There is also an air handler that is usually part of the furnace. This handler sends the warm or cool air through the ductwork. The most important aspect of this particular combination is matching both parts for maximum efficiency. The package system is self contained - not split up - and the entire unit is installed outside at ground level, or on top of the roof. 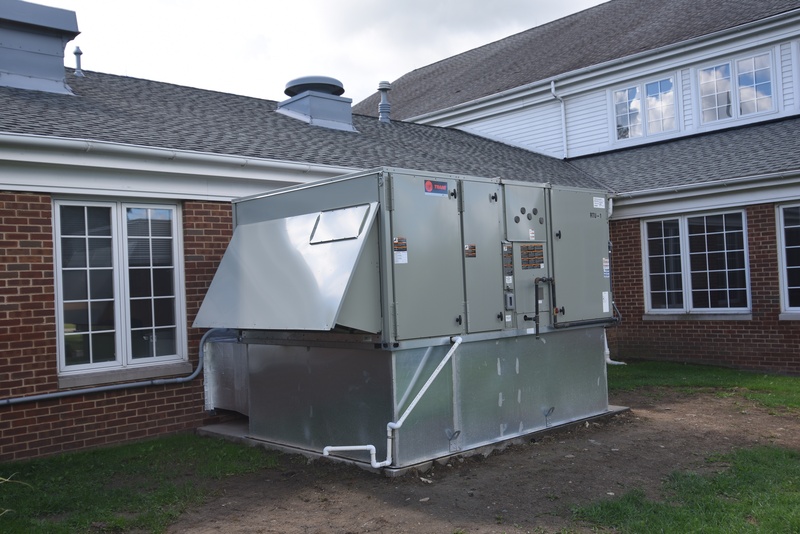 Here's a recent photo of a "package rooftop unit" we installed for a church. A package unit is a completely self contained heating/cooling unit that has the blower, coil and condenser all built into one unit. Fully self-contained air conditioners are ready with refrigerant and can be used on a rooftop like in this case or ground mount. It is imperative that the unit be level for your HVAC system to operate properly and efficiently. The older system was loud and there was no way to get a new indoor unit into the attic. The access was not big enough. Sitting on the roof as an option will air condition the space below and fit (unlike the constricted space in the attic). It was the solution for an easy-to-install outdoor unit. We figured out a way of routing the ducts from the unit into the attic and connecting to the existing duct system. Like a split system, the mini-split system uses an outdoor compressor/condenser linked to the indoor air-handling unit. The advantage of the mini-split system is that the indoor units are small and can be used to cool rooms, or zones. Also, a professional installer can create these "zones" and can hook up multiple units to one outdoor unit. Exclusive Blog Post Bonus: Download Our 11 Key Benefits to Fujitsu Mini-Split Systems. Easily save it to your computer or print it for reference. The Fujitsu Mini Split system is the perfect solution for homeowners who have boiler systems, and requires the minimum amount of disruption to your home. It offers both a central heating & cooling system that is perfect for seasonal transitions, although you can use it year round. Installation for this type system typically consists of two parts: an indoor unit called an air handler and an outdoor unit similar to a central air conditioner, but referred to as a heat pump. As part of a central heating and cooling system, it uses the outside air to both heat a home in winter and cool it in summer. A central air conditioner is really either a split-system or packaged unit. Choosing the right A/C system for your home is a decision you have to live with. You want to guarantee your comfort, cost-savings and optimum performance. "If you’re thinking about adding central air conditioning to an existing house, statistics show you’ve got a lot of company. In fact, while air conditioning was installed in just over 60 percent of homes as recently as the early 1990s, today about 87 percent of existing U.S. residences now enjoy some form of A/C." What's Involved When Adding Central Air Conditioning to Your Home? Time agrees central air conditioning will change your life. "No more sweaty nights tossing and turning because you haven’t installed the window units yet. For that matter, no more installing the window units—or bashing your knuckles carrying them up and down the basement stairs each spring and fall." What if you're on the fence as to whether you should upgrade? Is your heating or air conditioning system more than 10 years old or not keeping you comfortable? Is your air conditioner, furnace or boiler running a lot? Are you paying more than you think you should in energy bills? Before spending money on a new HVAC system, it's wise to check for costly air leaks. According to Energy.gov reducing air leakage can "significantly reduce heating and cooling costs, improve building durability, and create a healthier indoor environment." Once you decide you're ready to replace your system, the question of cost will be next on your list. Furnace Compare recently updated their article on central air conditioner pricing. It isn't about the average price of central air conditioners but the result of a series of interviews with contractors and distributors about how they set their prices. Does the equipment affect the cost of installation? Should I bypass the contractor to purchase equipment? Will the price increase based on the value of my home? How common is it to revise a bid? Their best advice: "periodically consider the age of your system and ask a technician during regular maintenance how the system looks." Basically don't get caught in an emergency situation where you are desperate for A/C. "The fact is that it takes time to do your research to find contractors to request bids from, research their bids and learn all that you need to know about AC system replacements." 75 percent of air conditioning problems can be resolved by the correct method of installation in combination with the right-sized air conditioning unit. Your electrical must be able to handle the additional demand of the A/C unit. An older circuit breaker panel may need to be upgraded to supply higher amperage. Modern homes may have a panel that has the ability to add additional circuit breakers. Discuss the possible upgrades with your contractor in advance of beginning work. A reputable contractor can recommend a licensed electrician that is familiar with upgrading electric service. The central A/C unit will have a condenser unit outside that will need space and the blower and connections inside your utility room. An independent electrical outlet hookup may be necessary with wiring to your main panel. All the required space should be planned out in advance. Your contractor can help to plan the details. Any construction necessary should be figured into the total cost of installation. This would be a good time to replace an older dial-type thermostat with a new programmable model. Modern programmable thermostats can save you significantly on monthly utility expenses. Available options are 5 or 7 day models with several different settings for each day. Several are capable of wireless control by your smartphone or other communication device from anywhere the internet is available. You can be notified when a filter change is necessary, time for regular maintenance, or if there is a problem with the system. Choosing an air conditioner size that is too large forces your unit to run constantly in short bursts, which can cause the unit to burn out faster. Furthermore, if your unit is running in short busts, it allows heat and humidity to creep back into the house, which can cause damage over time. Now that you know the importance of properly sizing your air conditioning unit, you need to know how to figure out the correct size. Do you know how the size of air conditioning units is measured? The other method is to use the Air Conditioning Square Footage Range by Climate Zone chart. Start by finding your location on the map of the US, which has been divided into five zones. Once you know your zone color, locate your home's square footage, and then you will find the proper air conditioning unit size. A HVAC professional can also conduct a load calculation to properly size your system. Load calculation is the process of determining the proper size of a furnace and /or air conditioner for a home. "A Manual-J calculation is a detailed analysis of your home’s central air conditioning and heating needs. There are two types of Manual-J calculations: a whole house load calculation and a room-by-room load calculation." ASM's revolutionary new online program, the HVAC Design & Consultation Program gives you the information you need to make the right decision on your HVAC project. After determining the size of the unit, your contractor should talk to you about efficiency, which is expressed by the seasonal energy-efficiency rating (SEER). The SEER rates how many BTU an air conditioner will remove for each watt of electricity it consumes. The higher the SEER, the less it costs to operate. Federal law requires that new A/C units have a SEER of at least 13. These units have lower operating costs, tend to be higher quality, have more safety features, better sound shields and lower voltage requirements. In general, the higher the SEER, the higher the initial cost for the unit. Older air conditioning systems have a SEER rating of 10 or under. Today’s more efficient air conditioning systems have SEER ratings as high as 23. SEER ratings only represent the potential efficiency of the system under perfect conditions. Over half of the system’s efficiency depends on correct equipment sizing for your home and proper installation. Professional air conditioning installation is arguably one of the best ways to guarantee an efficient and smooth running air conditioner. Unfortunately, most individuals for one reason or another make the wrong calls when installing new air conditioning systems. This not only compromises the system’s overall performance, but results in a home owner incurring unprecedented bills which could have been easily avoided. How do you go about choosing, adding, replacing, upgrading or installing your central heating and cooling to meet your needs? Seek a qualified HVAC professional. They will get all your questions answered. Use other online review sites or contractor directories to find local HVAC contractors.